For the online real estate software companies, email campaigns have proven to be one of the most profitable marketing tactics, boosting the brand and enhancing its productivity. It is one of the most non-intrusive lead generation tactics. A big ROI number can be easily generated from the lead list, irrespective of its size. 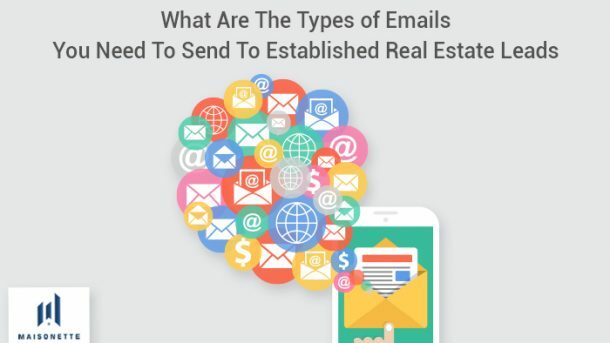 To master the marketing tactic and make it a grand success, it is essential for the marketers to understand the different types of emails to be sent to the real estate leads. Here are some templates to help you move your leads up the purchase funnel and make most out of it. Newsletters are the most common forms of lead engagement tools that progress the prospect further up the conversion process while ensuring drop-offs are less. It is your own property that should be used to serve expert content related to your business domain, cater to a prospects curiosity, and have instances for call-to-actions to elicit interest from them. From the customer data available with you, detect trends that help you customise the email targeted at a similar audience who would potentially sign up with you. Include the newsletter with industry news, market reports, own blogs with brief descriptions for each, and links to direct the reader to the landing pages of your website. A report by Salesforce predicts a 3800% return on email marketing spends made by online real estate software companies. But keep your newsletters targeted, create guidelines to be able to craft the theme, content and visual elements. Since the world is getting busier, and home buyers or sellers are certainly going the extra mile to find the best quotes for their assets, time is an absolute constraint. Sending over a compilation of the news and articles shared over the previous week or fortnight in an email is a great way to keep the brand recall quotient high. This compilation is nothing but a digest. It is similar to a newsletter but serves two purposes: recaps highlights for the audience to recollect and action upon (if they deem it fit), and use it as a tool to bring out curated topics and articles that sets you apart from the rest. Additionally, if you use tools in your arsenal, like Google analytics to understand top web pages being visited, you can plan which pages to add, which pages are to be promoted to connect to sales growth and more. Building segmentation on top of it to ensure better engagement, because a recent report by Mailchimp confirms segmented emails get 59% more clicks in comparison to non-segmented campaigns. The best way to for online real estate software companies to inform their leads of offers or campaigns quickly and economically is through marketing emails. These are one of the most successful forms of marketing that can be campaign-based, depending on your pipeline of promotional activities, or can be targeted with specific offers to certain target demographics. A study shows 44% of emails are never opened and engaged with. That’s because they aren’t targeted, thereby becoming irrelevant to the audience. By identifying recent activities like the success of previous email campaigns, or shifting audience characteristics, it gives you a forecast of how you could improvise it for future marketing emails. By talking about your most successful products using bold text, vibrant colours and a lot of visuals and images, you are positioning your brand as vibrant and appealing to your prospects, whose curiosity will be aroused to enquire further. In other words, your call-to-actions are working. Trend-spotting or ambush-marketing are relatively new terms that the marketing world is trying to take advantages of. It’s not a farce but has the real-world impact when audiences around the world or a region come together for a cause or an event. Think about the recently concluded football tournament or a local public announcement by your local government that has the denizens abuzz with activity. Craft an email campaign that could be the source, or a part of an overall marketing campaign that involves social media, YouTube or a hoarding drive. Through the lead management portal of your CRM solution, you can relatively understand user profiles and their interests or habits. The canvas is then open for you to take those learnings, be ingenious and creative in conceptualising a marketing campaign with an objective to make it viral. Building brand awareness and connecting trends with your product features or business messaging will help secure quality leads who could use your solutions, eventually. Focusing on the aspect of our human nature, of acknowledging and extending courtesy to the other party when a certain action is executed is needed through acknowledgement emails. This is similar to the ‘automatic reply’ email that gets triggered when there is an action done from the lead’s end. The actions could be when a form is filled, or when someone signs up to attend your webinar. Studies show that when firms send personalised transaction emails, it leads to more clicks and elicits greater engagement through the call-to-action buttons. Such transactional emails become useful for sectors like the property market, as the best software for rental property usually has these emails built in as default templates, which can be triggered as soon as an action is completed. This is another valuable form of email correspondence that keeps the brand in the minds of your prospects. Using the medium of emails is powerful, yet straightforward and affordable to nudge leads to the point of conversion. Every company must have a strategic plan in place, and not compromise on the basic tenets of email marketing: consistent posting, visually appealing and driving leads. An online real estate software companies like Maisonette offers these emails as part of its property management features so that users can manage it right from the dashboard. Marketers are increasingly trusting email which is the best platform to interact with leads and drive sales growth. Get easily executable steps like email right to frame your marketing fundamentals, before you start looking into other complicated marketing techniques.